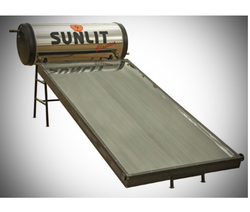 We are a leading Manufacturer of sunlit solar water heater, thermal solar panel, standard solar heater and domestic solar heater from Coimbatore, India. 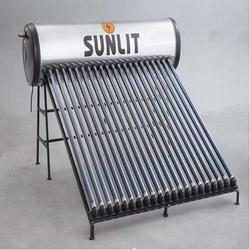 We manufacture and supply optimum quality SUNLIT Solar, Water Heater. These water heaters are manufactured from best grade materials, which are sourced from trusted and reliable vendors of the industry. The water heaters offered by us are known for their sturdy construction, resistance to corrosion, low power consumption, low maintenance, easy operations and longer functional life. We are considered to be one of the leading manufacturers and suppliers of this Thermal Solar Panel. For the purpose of maintaining this reputation, we engage in using the finest raw materials and modern machines, in accordance with the industry set norms and guidelines. Further, the offered product is widely acclaimed for its superior performance and unmatched service life. Made available to clients at the best rate possible, the offered Standard Solar Heater is amongst the primary preferences in the market. Manufactured in accordance with the industry set norms and guidelines, its quality never deteriorates. Further, the offered product, owing to the finest raw materials and modern machines used in its making, offer commendable functionality and longer service life. 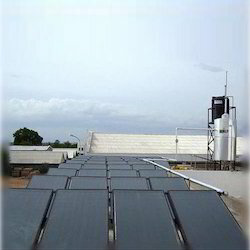 Solar hot water system is based on the principle of back body absorption. The black surface of the collector absorbs the heat energy from the sun rays and transfer it to the water passing through The copper tubes. Hot water being lighter in density, raised to the insulated storage tank And equal amount of cold water replaces this hot water from the copper tubes.